February | 2015 | Peroglyfer – Machine Learning changes math. Math changes everything. The idea is simple. The reason I don’t want paper advertising is that it generates a lot to be thrown away. From this I got the idea that for electronic advertising email maybe the delete part could be made into a feature. The idea is then that serious companies could make life easier for people by adding a code to their emails that tells the mail server when to delete or hide their message. For instance how long the mail should reside on the server if it has not been viewed. Here the reason could be that the mail is advertising some low prices that is only valid for a week or so. I wonder if this could work. Perform some statistics on a lot of existing code divided into several types of categories. Be it games or utilities. Python or any other code for that matter. By scoring how frequent a module and it’s submodules are you get an overview of what is important for that type of program. Then if you as a learner want to make a program in such a category you can then start to read about the most used modules and submodules first. Example statistics of submodules in pygame from 15 simple python games. 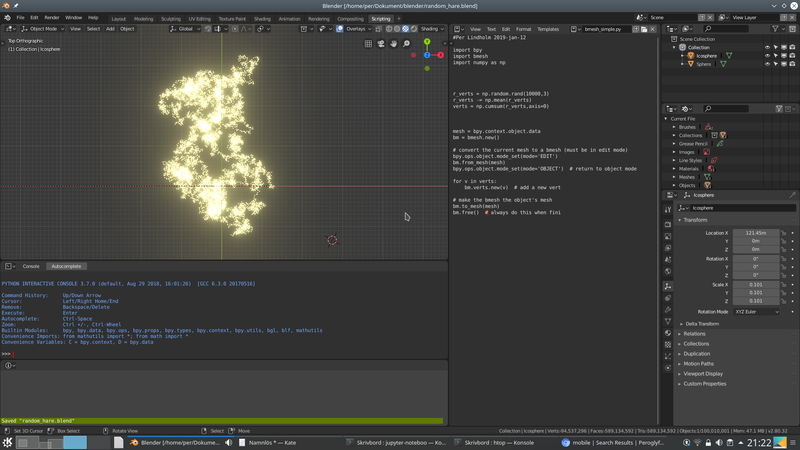 Even if my program is not very accurate I can see what parts of pygame to focus on for making a simple game. The idea is simple. Using ssh you can login and run commands on your wifi connected Raspberry Pi. 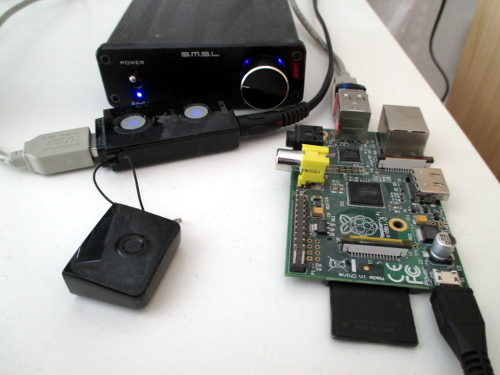 In the image below I use a simple USB soundcard that I have connected to my amplifier. From the terminal you then play music with mplayer and change some of the volume with alsamixer. Choosing Raspbian from NOOBS works just fine. I think this is an excellent opportunity to have some fun and learn a little Linux. I had the idea to replace my desktop computer with the hardware similar to that found in a mobile phone for a long time now. I think this is important because the Internet is a part of every day life and you should be able to buy cheap computers. What I can say is that I really like this little quad core computer. Youtube will work depending on the browser. In Epiphany I got a working html5 player. The best part is that it worked wonders with my little external USB Xonar U3 sound card. With mplayer * and ALSA the sound in the headphones sounded very good. I would not take a chance in buying an expensive sound card for the raspberry pi 2 at this time but if you have one extra it will be worth testing.